The "Red Currant Tomato" is considered a wild species of tomato native to Ecuador and Peru but naturalized elsewhere, such as the Galapagos Islands. This plant is known to botanists as Solanum pimpinellifolium, or simply "pimp." 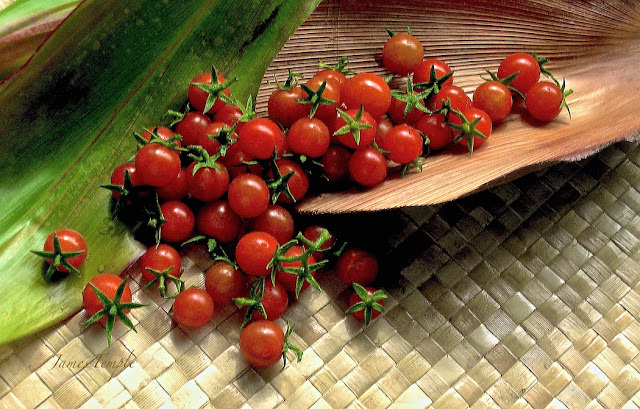 The plant, according to the Smithsonian Journeys Quarterly, is the wild ancestor of all the tomatoes we eat today, and still grows wild in northern Peru, southern Ecuador, and here on Moloka'i. I had never heard of, or tasted, these little gems until my wife bought a little plastic bag filled with them last year. She bought them from a part time resident of Moloka'i named Max Quinney. He was selling them at our local Saturday farmers' market here on Moloka'i for $4. The next week at the market I asked him where he got the seeds and he told me that they starting growing in a pile of wood chips that he had gotten for his garden. The chips came from our local green waste land fill. I also spoke to a couple of local Hawaiians who said "Oh you mean Moloka'i tomatoes" as if they have been growing here for a long time. These little tomatoes are amazing because they are so small, no bigger than a shelled pea. You truly can't just eat one, because of the intense tomato flavor. After doing a little research online, I found that apparently each plant produces hundreds of sweet fruit within about 65 days after planting the seeds. It is recommended to grow them in hanging baskets because its rambling branches can grow out to as much as 8 feet long. They like direct sunlight, and will produce fruit all summer long. Currant Tomatoes are a different species from standard garden tomatoes, and have been known to readily reseed themselves and continue to grow season after season if you maintain the soil fertility and water them. I also found out that Red Currant Tomatoes are an exceptional source of lycopene, a naturally occurring pigment that doubles as an antioxidant. Lycopene is known for its anti-cancer benefits, such as preventing, fighting and repairing cell damage in the human body. The tomato’s array of nutrients and antioxidants, including the especially potent lycopene that is found in its highest concentration in tomatoes, also helps support healthy eyesight, cardiovascular health, and more. From a culinary standpoint, Red Currant Tomatoes are essentially miniature cherry tomatoes, and are treated as such in recipes. Hence, Red Currant Tomatoes can serve as a substitute for cherry tomatoes. Seasonal recipes and ingredient pairings are best suited to showcase the Red Currant Tomato's full flavors. Consider leaving Red Currant Tomatoes whole in any application, as their attributes will be amplified. Dot Red Currant Tomatoes onto appetizers, scatter onto salads, float them on tomato-based soups, or simply freeze them for a cold summer treat. Try tossing with couscous for a simple side dish, or use them to make your own sun-dried tomato raisins. With their tangy-sweet flavor, they are considered a type apt for pickling or making preserves, such as a sweet tomato relish, and they can also be used for juicing or making sauces. Like all tomato varieties, store Red Currant Tomatoes at room temperature until ripe, after which refrigeration can prevent further ripening and decay. Yesterday Mr. Quinney came back to my wife's farmers' market booth with another bag of little currant tomatoes to sell. Naturally I wanted to find out where to buy seeds for this little tomato. To my amazement I found a number of sites online. Soon I will be growing, and enjoying my own red currant tomatoes. I took the photo above this morning using Mr. Quinney's red currant tomatoes that I bought yesterday. Lightly toast bread. Spread each toast slice with 2 tablespoons ricotta. Scatter tomatoes over the ricotta. Drizzle the toasts with a small amount of extra-virgin olive oil (1/2 teaspoon each), and sprinkle with salt and freshly ground black pepper. Broil 1 to 2 minutes, or until cheese is bubbly. Note: As a variation to this recipe, replace the Ricotta cheese guacamole made with avocado, mixed with fresh lime juice, salt & freshly ground black pepper to taste. Top with tomato and chopped cilantro. You will need 2 microwavable ramekins (I use 6-oz Pyrex custard cups). Place half of the thinly sliced sandwich ham into each ramekin. Break two eggs on top of the ham. With a fork pierce the yolk of each egg. Put a sliver of butter in the middle of each ramekin. Now sprinkle tomatoes on top. Add salt and pepper to taste, and sprinkle with chopped parsley. Place both ramekins in your microwave oven and cook for about 2 1/2 minutes. 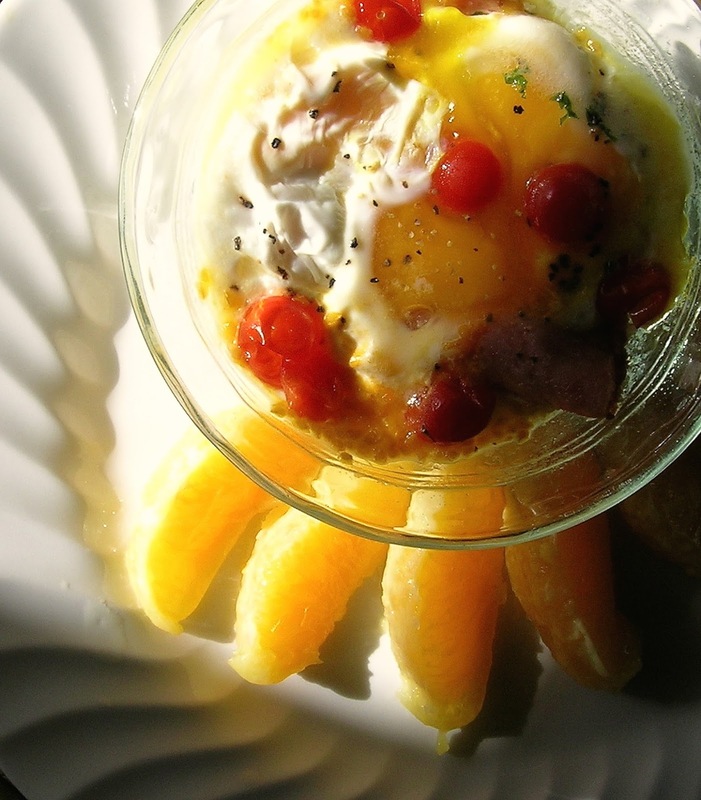 Place ramekins on a dinner plate, garnished with orange sections. Serve with toasted English muffins spread with your favorite jam. 3 cups of red currant tomatoes or cherry tomatoes, cut in half. Heat oil in a deep sauté pan, or wok. Sauté the garlic and onions for about a 1-2 minutes. Add the ground pork and crumble the meat with a fork to prevent clumping as you brown it on medium-high heat. Season with fish sauce and chili sauce, to taste. Pour in the soy sauce and water. Bring to a boil. Cover then simmer on low heat for at least half an hour to allow the meat to absorb the flavor of the liquid. Immediately add the long beans and squash, stir and cover. Simmer for an additional 10 to 15 minutes, or until the squash is tender and the beans fully cooked yet still retain some crunch. Correct the seasoning if necessary. Finally, sprinkle each plate with whole red currant tomatoes or sliced cherry tomatoes. Serve with white long grain rice. Makes 4-6 servings. This fresh savory jam makes a fantastic appetizer (pupu) when spread on your favorite cracker with creamy goat cheese, or mixed in with ahi tuna to make "Jamin Poke". Try it on burgers instead of ketchup, or as a condiment with roasted meats or grilled fish or shrimp. I even make a salad dressing out of it by adding seasoned rice vinegar and olive oil to the tomato jam. I like using red currant tomatoes because of their intense tomato flavor. 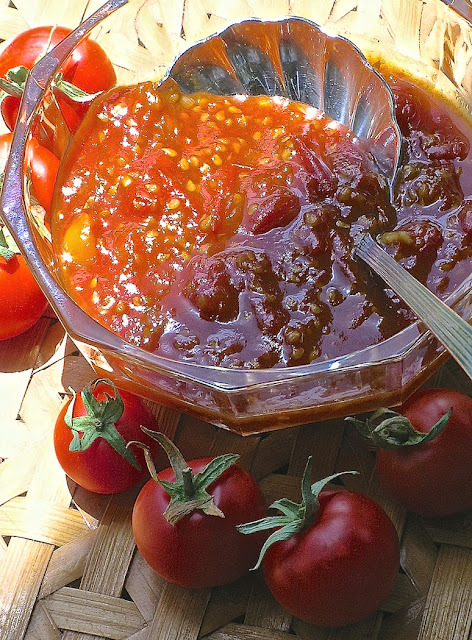 To make this jam: Wash tomatoes then cut in half (if using cherry tomatoes). Combine with the rest of the ingredients in a saucepan. Heat slowly to a simmer. Stir every 15 minutes or so to prevent sticking, until the tomatoes are syrupy, about 1 hour and 15 minutes, avoid scorching as the jam condenses. You should end up with a thick gooey tomato jam. Taste and adjust seasoning if necessary. Use the jam immediately or let it cool and store, covered, for up to 1 month in the refrigerator, or put the jam into sterilized jars and seal. Makes about 2 cups. Note: You don't have to use red currant tomatoes, you can use just cherry tomatoes, or a combination of both, as long as the tomatoes have a lot of flavor. This jam will taste different depending on the tomatoes you use.